Enter for your chance win set for life sweepstakes with the PCH sweepstakes, you can win $7,000 a week for life! The winner will be announced on NBC on November 26th 2013! Say good bye to all your financial worries for the rest of your life… You could literally retire if you win this mega cash sweepstakes! 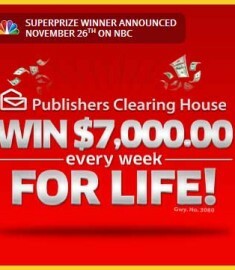 This is the largest weekly lifetime prize ever offered by Publishers Clearing House. PCH sweepstakes are always of epic proportions and this one is seriously big big big! What would you do with $7,00o for life? I think the question is what would you not do! You can pay off all your debts and then just live your life while the money rolls in. You can plan dream vacations, send your kids to college with no worries! You can sit and let the money accumulate and buy your dream car after just a few weeks. $7,000 a life is way more than most people would make at their jobs in a month! If you are struggling to make ends meet and dreaming of a better life for you and your family then this is the sweepstakes dreams are made of. This is so big that NBC will be announcing the winner on TV! A cash giveaway like this deserves some recognition, so take a minute out of your day to fill out the entry form on the PCH website today! The Set For Life sweepstakes is exactly what it says on this tin, you will be set for life, no worries, no limits! So seriously what are you doing still reading this… enter now and make your dreams come true! 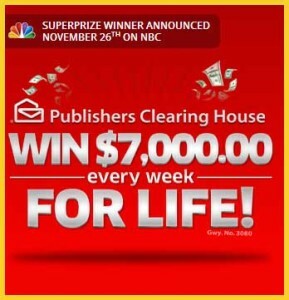 Win $7,000 for life PCH sweepstakes! I could really use this win luck gotta get better. Have played n entered pch for yrs and my mother and grand mother before me has played.i have recently lost job and farm it would come in handy at this time be able to help others again. Winning this $7,000.00 for life, would certainly help me spend the rest of my life without money worries, and I will use it to help others as GOD would want me to, for charities of those less fortunate. I am 73, living only on my Social Security. I hope that all entries are blessed.May the person who receives the blessing use it wisely and remains humble . God bless everyone!!! Well Hello there PCH , I hoe your all having a great morning today as it is now march the 21, 2014 . I a sure you all are very busy doing your jobs and the stuff you all have to there at PCH . Next I like to thank you for taking the time out of your busy day to read this little note here that I am typing . I would have to say yes it would be very great to get a big surprise at set for life . Then I all so know its all about the waiting to see what is going to happen on the day all over again . Do to what it is . So for now I leave at this and keep on waiting here in Wisconsin. thanks dated March 21,2014 .